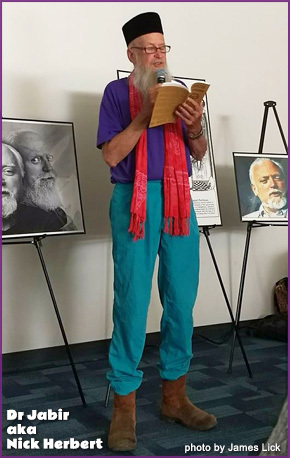 Notes from Rasa on RAW DAY 2017 . . .
An enthusiastic gathering of RAW fans and friends Found the Others at the Museum of Art and History in Santa Cruz on July 23rd, 2017. I’m sure there were many meaningful encounters during the day, but the meeting of the “daughters” gave me a deep smile. 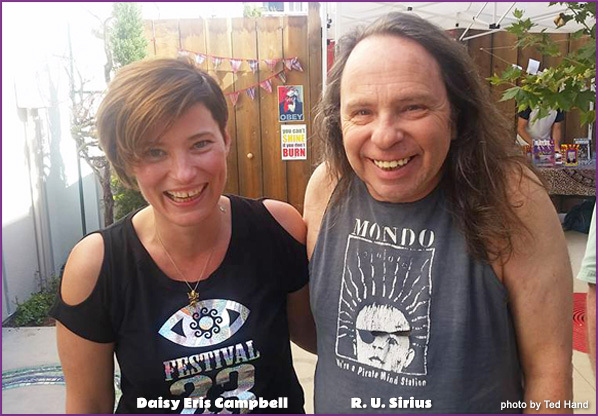 Bob’s daughter Christina Pearson met Daisy Eris Campbell, writer/director of Cosmic Trigger The Play, and daughter of Ken Campbell, producer of Illuminatus! (the play). 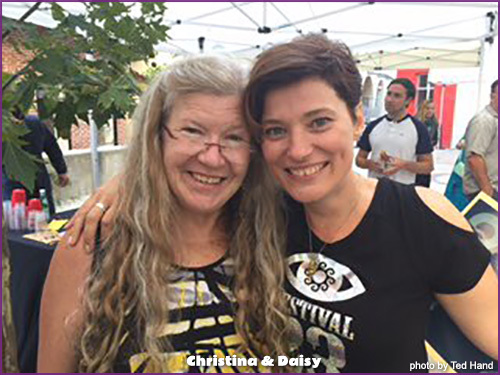 Daisy began the day with a spirited Discordian welcome. 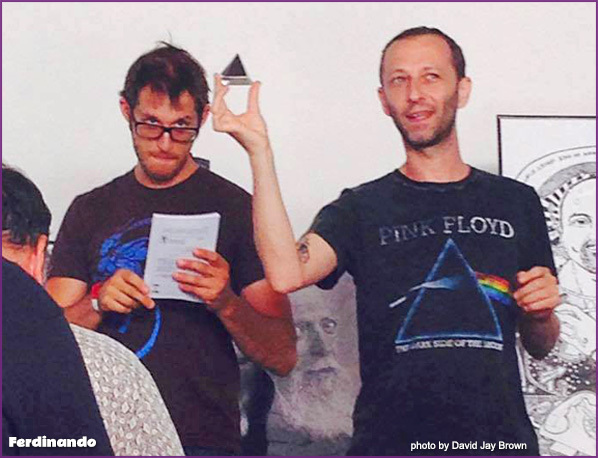 She then introduced Doctor Jabir, aka poet/physicist/QuantumTantrist Nick Herbert, who gleefully countered the theme of all of the other presenters by not talking about what he “got from Bob.” Instead, he told a tale of something Bob stole from him – sweet discord! Riffing like a jazz musician, writer Erik Davis gave a thoughtful extemporaneous rap on Bob’s model agnosticism and the rise of a post-truth politics. 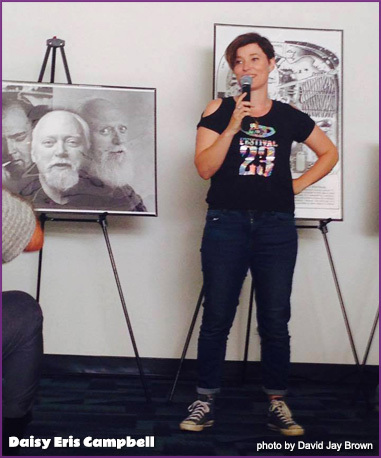 Christina shared some heartfelt memories of life in the family of RAW. 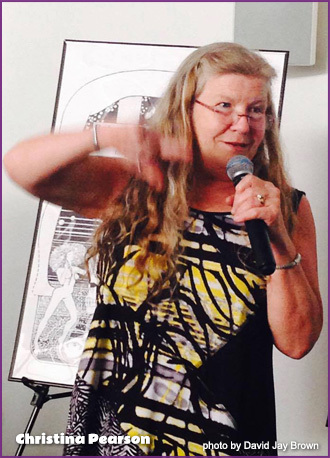 Daisy told the tale of her connections to the Illuminatus Trilogy and Cosmic Trigger in her entrancing theatrical style. Discordian Historian Adam Gorightly caught us all up on current workings in the name of Eris. R. U. Sirius recited new song lyrics, boisterously singing the last line. Could anybody in this pinched surveilled nation write another Howl? 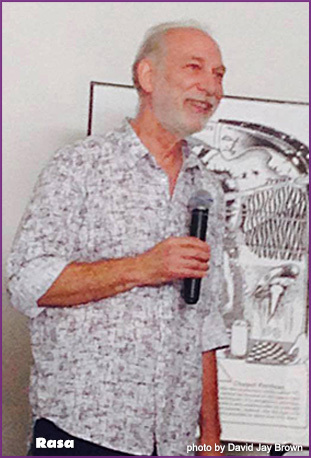 As Meta-Programming Director of the RAW Trust and Co-Publisher of Hilaritas Press, I offered some moments of thanks to the RAW community and to a number of critters in particular who have gone above and beyond to keep the lasagna flying . . . 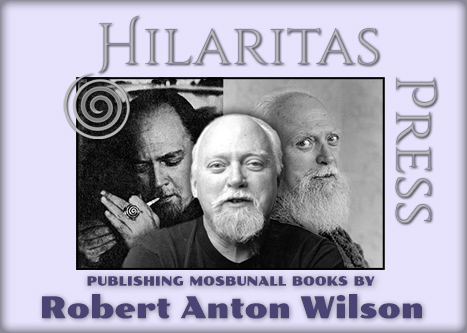 Propaganda Anonymous (aka Gabriel Kennedy), has a new book Chapel Perilous: The Life and Thought Crimes of Robert Anton Wilson due out this year from TarcherPenguin. 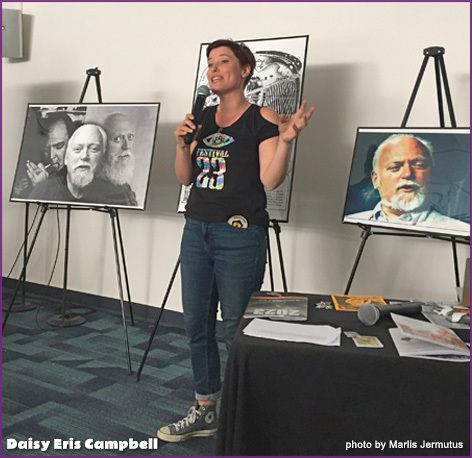 Daisy Eris Campbell completed another successful run of Cosmic Trigger the Play, and through Daisy’s connections, Hilaritas Press published a new audio book of Cosmic Trigger featuring Oliver Senton, “Robert Anton Wilson” in Cosmic Trigger The Play. Many thanks for the audio book production also goes to Steve Fly Pratt who helped to organize the whole project and produce the recording along with the folks at Iron Man Records. And as always, thanks to Fearless Scott McPherson of amoeba design for his art and design work for Cosmic Trigger the Play, and for designing our new Hilaritas Press book covers! I also gave a thanks to Toby Philpott (aka Alias Bogus), ostensibly for contributing his post to our blog last year on the history of the Maybe Logic Academy, but also for his general RAW-infused guerrilla ontological postings and activities. Before I could also mention a bit of Toby Philpott trivia, someone in the audience beat me to it by insisting that I note the fact that Toby is also renown for his role as the head and left arm of Jabba the Hut in Star Wars: Return of the Jedi. Tom Jackson for helping with editing and proofreading. And a special additional thanks to Tom Jackson for his continually entertaining and informative blog: rawillumination.net. And last but not at all least in any sense, enormous thanks to artist Bobby Campbell for numerous instances of sometimes crucial help he graciously offered over the last year to the RAW Trust and Hilaritas Press. I suddenly felt a deep empathy with him. Guess that’s what the Romans meant by “humanitas” and Buddhists call compassion for all living beings. Don’t know much about acting, but writing novels sure teaches a lot of that. I’ve learned more creating/becoming my monsters and villains than I’ve learned creating likeable characters. 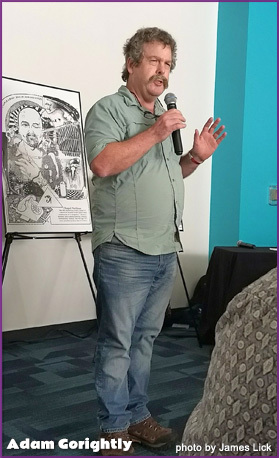 The original artist for Cosmic Trigger, John Thompson was handing out signed copies of his illustrations throughout the day, and expounding on one of his many area’s of expertise, from mythologies and conspiracies to the intelligence of the stars. 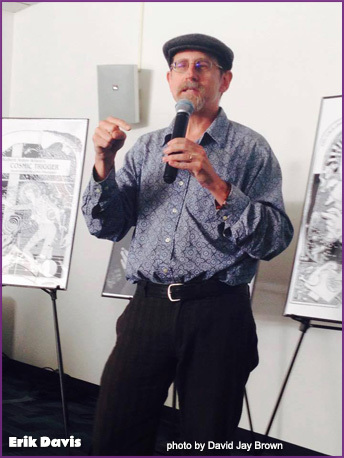 Artist Bobby Campbell (illustrator for the Historical Illuminatus Chronicles and other RAW-related publications) was giving away copies of his beautifully crafted new RAW comic book. RAW Archivist Andrew J. O’Keefe videotaped the event. U.K. DJ Greg Wilson provided a seamless soundscape during interludes in the program and ended the night with a two hour set of his “Super Weird Substance.” Several people reported finding quarters at the venue. Three old friends of Bob . . .
A note about the next day . 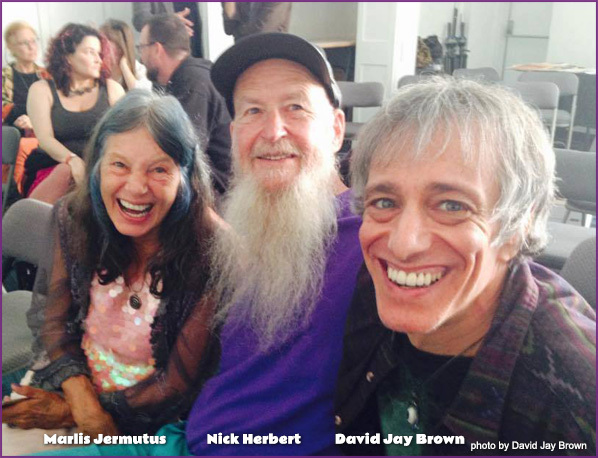 . .
My dear friend Marlis Jermutus (who introduced me to RAW many years ago) joined Daisy, her husband Greg and me for a visit to Oberon Zell’s Academy of Arcana in Santa Cruz on July 24th. I had my iPhone out and captured Daisy in a wonderful minute and a half of her reciting Macbeth in New Guinea Pidgin English. Sorta a RAW DAY Extra, and well worth a watch! 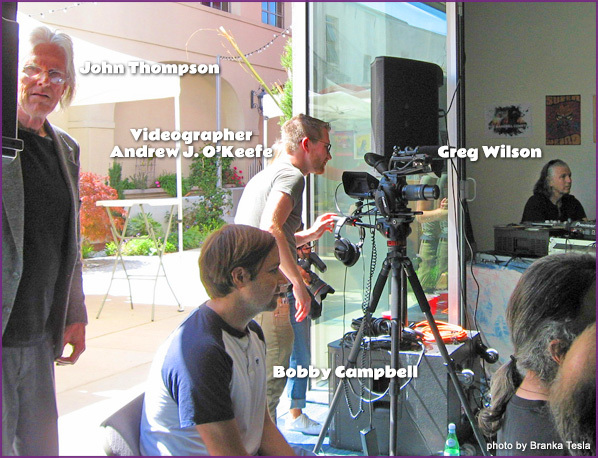 A colossal Thank You goes to Dustin O’Reilly, Jeff Walsh, Marisa Marlowe and Michelle Olley for all the crucial behind-the-scenes organizing and heavy lifting that made the event run seamlessly. 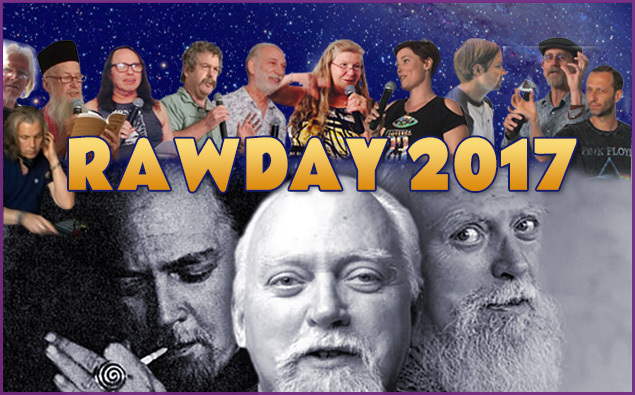 Dozens of planning emails and days of preparation began when DJ Greg Wilson, in planning a California tour, contacted event organizer Dustin O’Reilly to find a venue for RAW DAY. From there, the lasagna kept flying higher and higher.